The lizard skitters along the road, no cares in the world. Sure, there are people here but they mostly leave him alone. Besides, they can’t catch him. A few of the little ones have tried. A boy appears along the road. The boy sees the lizard. The boy remembers the conversation over dinner the night before. Specifically, the part about the lizards. His family had commented on how fast the lizards were. I bet I’m faster, he thinks to himself. And then, on the kind of whim that only young boys seem to have, he decides to prove it. He takes off running. The lizard doesn’t know he’s been challenged to a race. He only knows one of the not-so-little-but-not-full-sized people is running roughly toward him. He picks up speed accordingly. The boy steps it up a notch. He is faster than the lizard. He knows he is. He runs alongside the lizard, gaining ground. He’s winning! He’s winning! He knew he was faster! Suddenly, the lizard leaves the boy in his dust. The boy doesn’t know what happened. He was winning. And then he was on his back, dazed and confused. He rolls over and struggles to his knees. He sees a rock nearby. He crawls over to it before attempting to stand. Once on his feet, he sees a concerned woman nearby. “That was quite a crash. Are you OK?” she asks. He stares back at her blankly. She asks again. He mumbles his response before heading off to find his mother. At least, that’s how we think it happened. We have to fill in the blanks because my son Daryl, the great and mighty lizard racer, doesn’t remember anything between winning the race and the second time the woman queried him. When he walked away from the woman, she assumed he was embarrassed and trying to act tough. He entered the room where his sister and I were working on our stained glass projects. He was sweaty and agitated. I could tell something was wrong but was unsure whether he was in physical or emotional pain. He grabbed his forehead and burst into tears. Jane hurried to get some medicine out of her backpack while I gently moved his hand to check his forehead. There was nothing there. No bump or bruise or abrasion. I found a nasty line of bruising on his right forearm, but nothing even remotely tender on his forehead. “That white thing out there.” He motioned vaguely out the window. I didn’t see a white thing that he could have hit his head on. I gently pulled him outside and asked him to show me. He pointed to a white barrier, about three feet off the ground, that was essentially permanently across the road between the buildings at the camp and conference facility we were staying at. I was confused and a little concerned. I sent him back to our room to tell his Daddy and then went back into the stained glass room to gather my things for my basketry class that was starting in a few minutes. When I came out of the room, my husband and son were standing nearby and my husband was trying to get a handle on what happened. We exchanged glances. I ran my fingers through Daryl’s hair. He winced. I checked the back of his head, where I could see that a portion of his scalp was red. “What did you have for lunch today?” my husband asked, after checking the abrasion on the back of our son’s head. “I don’t know.” Lunch had been less than two hours earlier. Each ‘I don’t know’ statement was delivered the same. He wasn’t getting irritated or defensive. He was just calmly and a little distractedly answering. This didn’t feel right. “What did you have for breakfast?” my husband tried. I looked at my husband. We were at least a half hour from the nearest hospital. “I’ll take him back to the room and keep an eye on him,” he said. “Well, I don’t know, but I guess he ran into that road barrier. He didn’t get up right away. He crawled over to a rock first.” She would later decide that she was pretty sure he had been on the far side of the barrier, crawling under it to get to the large rock. This led us to believe that he had likely run into the barrier, flipped over it, and landed on his back, hitting the back of his head. With a pediatrician and two nurses attending the conference with us, not to mention my husband’s own past emergency medical training, we decided that we did not (yet) need to take him to an emergency room. In fact, he seemed to be doing better that afternoon and soon returned to his own sketching class, with Dad in tow to keep an eye out for further symptoms. For the rest of the week, he’d complain of headaches if he was too active. He felt a little nauseous the first day. We nixed his participation in the high-ropes course on the last full day and grew irritated with him when he reported a new headache after spinning on the tire swing “really, really fast”. It’s hard to get kids to take brain injuries seriously. But he rested as much as could be expected and limited his screen time and tried to take it easy. It’s been three weeks since the concussive conclusion of his lizard race. He’s doing much better. And he’s learned to grin sheepishly when folks ask him if he’s seen any lizards lately. I had a lot of dolls and stuffed animals when I was young. I mean, a lot. So did my little brother. We had our favorites. I had Julie, the wrap-around monkey puppet. She frequently wore earrings, which really helped me out when I forgot to wear some to the lake shortly after I got mine pierced. She let me use hers. She also went with me when the day care center took us to see Gremlins in the theater. That was good because that movie scared the living you-know-what out of me and I don’t think I could have survived had she not been there to wrap her arms around my eyes. And then there was Jennifer, the home-made doll that the wonderful woman next door made for me. And Jane, the knock-off Cabbage Patch doll. And… Rufus? A really big dog that was usually wearing a T-shirt. My brother had LeMutt and LeMutt’s girlfriend Fifi. I think LeMutt and Fifi were available in different sizes and we had a smaller version of LeMutt than Fifi. Didn’t seem to bother us much. One of my fondest memories concerning our stuffed animals was a trip to the lake one year. I’m not sure how old we were. 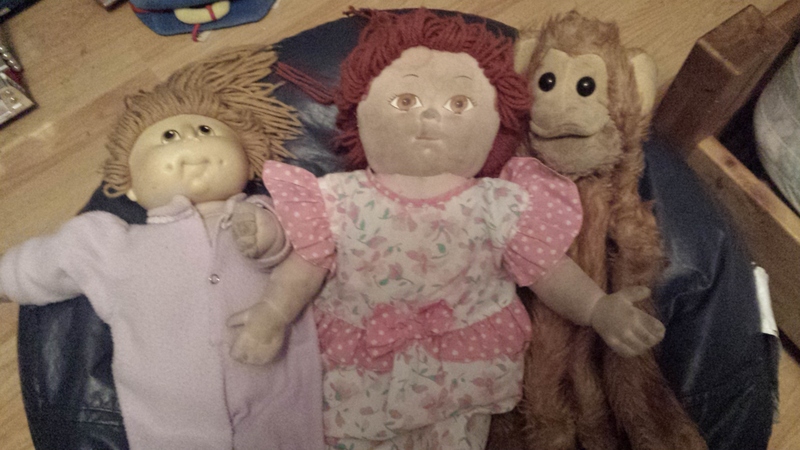 Old enough (by eighties standards) to be home alone but not so old that we had put the dolls away. Maybe ten and seven? Anyway, mom had left us with instructions. We were supposed to load a few supplies into the pop-up trailer and make sure we were ready to go when she and my step-dad got home from work. We were strictly limited to two stuffed animals each. Yes, Mom. We understand completely. Two animals each, however, was unacceptable. We soon developed a plan. The pop-up was basically already packed and closed down so no one would be crawling into it or opening it up. It was a safe haven. We started carrying stuffed animals out by the armful to stuff behind all the boxes in the trailer. We got caught up in the adrenaline rush of the plan implementation and took nearly every single stuffed animal, no matter how small, insignificant, or unloved out to the trailer. Some careful planning went into which four animals were in the car with us. They had to be believable as the four we would most want, of course. Rufus was the biggest problem (literally). He was too big to hide in the trailer without risking exposure if the parents should perform a quick flashlight check before departure. But he wasn’t likely to be one of my top two. I agonized over this for quite some time before deciding to risk suspicion. Still, there were still more animals that didn’t fit in the trailer. By the time our parents got home, we really wanted to pull off a complete coup. So while they were busy, we’d quickly and quietly sneak small animals out to the car in our shirts and stuff them under the seats. We hid even more animals in our pillowcases and laid the pillows in the backseat, carefully situating them so the lumps weren’t obvious. And then, when it was time to go, we walked to the car, each holding two, and only two, animals. Looking back, I laugh at how much work went into hiding things. As a parent, I can only imagine how distracted they were with everything they needed to take care of. No wonder we got away with it. We sat quietly in the backseat as the car pulled out of the drive. Occasional furtive glances were shared as my brother waited for me to give the indication. The key to success with the in-car animals was to wait until we were too far away for them to turn the car back. But not too far that we couldn’t enjoy them! Besides, we were really itching to reveal our hand! Finally, I nodded and we each darted under the front seats to extract the animals. We pulled them gleefully from our pillowcases. Our mother looked back in shock. We laughed and laughed and laughed. Mom grinned and shook her head. Success. And we hadn’t even gotten in trouble. One more hurdle remained. When we got to the lake, they began to raise the trailer. (A pop-up trailer has a roof that winds up and two beds that slide out to leave you with a big open space in the middle. Many have a kitchen and table in them. Ours was a very basic model – just the two beds. All of our towels, dishes, etc. were stored in Avon boxes in the floor.) They let down the door. They stepped inside. They saw the animals. We shrieked in delight. Mom was not quite so forgiving this time. Then again, it was so over-the-top ridiculous that after a brief expression of anger, she just shook her head in disbelief. Then she said that every single last animal had to fit on our bed. Every single one. It was a challenge to do that and still have room for us but we pulled it off. Mom couldn’t understand why we wanted so many stuffed animals at the lake. It wasn’t the having them there that we wanted – it was the getting them there. To this day, it remains one of our best cooperative acts of subterfuge. I still have “the big three”: Jane, Jennifer, and Julie. My kids found them in the closet one day and they came back to life (Woody and Buzz would love to know that). Only, despite my insistence, they aren’t named Jane, Jennifer, and Julie anymore. I’d like you to meet, from left to right, Shirley, Ginger, and… Mr. Muffets. That last one has taken some getting used to. I was excited about my day in London. I had studied a map, looked at a guide book, and talked to a few people who had been there. I had my plan. I rode the subway from Heathrow airport to Hyde Park station in downtown London. I didn’t look at my phone during the ride because it was to serve as my camera and I was very concerned about the battery going dead. Instead, I immersed myself in people watching. My mother-in-law says I should engage people in conversation wherever I am. This is a talent of hers and it has brought her many delightful experiences, but it’s simply not me. I’m not overly sociable, particularly with strangers; I find small talk tedious; and I’m very sensitive to those people who really just want to be left alone and find people like my mother-in-law obnoxious. So I sat and watched for the 45 minute ride. I noticed that no one was on their phones. With only a couple of exceptions, they weren’t talking to anyone either. Most were sleeping or reading or staring off into space. There was a fun guy in dreadlocks and a rainbow knit top hat, who I gather drives a bus around the airport. He and the flight attendant talked and laughed most of the way. The woman across from me answered her phone at one point and I was fascinated to see that the inside of her arm and palm were covered in Mehndi (intricate henna tattoos). Eventually, I was off the train and heading out into a beautiful park in London. I checked the map in my guidebook, started walking, and marveled at all the statues and arches and big trees and double decker buses. As I approached Buckingham Palace, I was surprised at the number of people standing around. I managed to get to about the third row of people on an obscure stretch of fence and realized that everyone was waiting for the changing of the guard. After waiting for five or ten minutes, I realized that a) I had no idea where exactly the ceremony would take place and b) it was still forty minutes until showtime! Shocked at how many people were willing to wait that long (thousands of people!) and fully aware of how quickly my day would fade, I moved on. Checked out Westminster Abby, got all choked up and pensive when I saw the MLK statue, bought a tote bag for my husband, and walked on. I rounded the corner and got a full, perfect, beautiful view of Big Ben. It struck my already emotional being that this – this view was the one thing my ten year old son wanted from me. I was grateful for the sunglasses that hid the teary eyes. I marveled at how raw my emotions were. I checked out the Parliament buildings, peeked down Downing Street, looked at the “Eye” of London, and made my way toward St. Martin in the Fields near Trafalgar Square. I am a person who usually worries what people think. Stopping to take pictures of random non-significant stuff was challenging as I thought people would find me crazy. To steel myself against caring about what they thought had the unintended consequence of drawing me further within myself. I was my own bubble floating down the street through crowds of people. I ate lunch at the Cafe in the Crypt under St. Martin in the Fields. This was when I was first struck with a strong sense of loneliness. I’ve heard before how hard it is to eat in a restaurant by yourself. It is completely true. I found myself wishing I had brought my Kindle. I had positioned myself at a two chair table such that one side of me was up against a pillar, which felt sheltered and secure. Unfortunately, this meant my back was to most of the dining room, severely restricting my people watching opportunities. I saw another woman eating by herself and idly considered joining her. Fears that she wanted to be left alone or that she was expecting someone stilled me. When I left the Cafe, I noticed a wall outlet near the gift shop so decided to plug in my phone. That tied me to the general area and left me with nothing to do. I found myself wishing I had brought my Kindle. Then I noticed people bringing some interesting stuff over to a nearby table. I wandered over to where they had come from and saw that you could pick out a metal etching and do a wax rubbing of it for as little as 3.50 pounds. Something to do while the phone charged and a cool souvenir! I picked out a dragon and the gold and dark red wax sticks and settled into the task. I seriously think this might have been my favorite part of the day. I saw the Tower of London, the Crown Jewels, Shakespeare’s Globe Theater, Platform 9 3/4 at King’s Cross Station, Sherlock Holmes’s residence, the Millennium Bridge, and all those places already mentioned and more, but sitting at a table rubbing wax on a dragon etching was probably the best part. I was doing something. I saw all those wonderful places but had no one with whom I could turn and remark on it. I started to feel like I was simply documenting the sights to take back and show my family. I was checking off my list. And I was getting more and more isolated in my head. It didn’t necessarily bother me. It just felt so incredibly strange! I was sore and tired by about 4:00 in the afternoon. I would push myself for another 5 hours before crawling back into my hotel room. I made the wonderful call to visit King’s Cross station… at rush hour! All so I could see what? A non-existent place out of a children’s book? I was so tired that I didn’t even notice the right place and wandered aimlessly around platforms 9 and 10, taking pictures of random bits of wall to tell my kids “See? There’s platform 9 3/4!” But on my way out, I happened to notice a crowd. A long line of about 50 people or so. All waiting in line to take their picture going through the gate to Platform 9 3/4. There was a luggage cart, suitcase, and owl cage all cut in half and fastened against the wall. Two employees stood there with a wand and a scarf from each house. When it was your turn, they wrapped your neck in the scarf of your choice, handed you the wand, and held the scarf out behind you so it’d look like you were running. It was cool. I didn’t get in line though. For one thing, I was done waiting in lines. And I was extremely tired and my lower back felt like it was on fire. And I had no one with me to take my picture when I got to the front. Sure, the employees likely would have done it, but… it suddenly felt particularly lame for a 40 year old woman traveling by herself to wait in line to pretend like she was heading to Hogwarts. So I moved on. Well, after taking pictures and video of some folks doing it so my kids could see. They loved it. People ask me if I had a good time in London. I reflexively say yes. In reality, I’m not sure. I saw a lot of neat things. I’m glad I was there. I felt extremely accomplished to have navigated the subway and everything else all by myself. It was a growth experience. I’m a better person for it. I feel lucky. I’m just not sure I had “a good time.” For that, I think I would have needed my family. Or at least someone to walk around with. When you are sightseeing by yourself, as I was last Friday, having extended my time in England by a day so I could checkout London, you really don’t have anyone to talk to, except for strangers. Most strangers are busy doing their own thing – especially on the subway. I didn’t see anyone making small talk there! They either talked to the person they traveled with or were silent. I, being alone, was silent. However, sightseeing and being unfamiliar with an area forces one to speak to at least a handful of strangers to get around. My first was just a block from the hotel at the bus stop. I had been told to catch the U3 bus to the airport where I could then get a day pass for the London Underground. The person at the front desk had been kind of vague about where to go. And I didn’t know how to read the signs at the bus station. There was a British family standing there so I walked up to the woman who was probably the grandmother and asked if the U3 bus stopped there. She told me that it didn’t and that I needed to walk down to the other one. As I walked away, she suddenly called out (calling me “Darling”) and said she was mistaken – the bus did indeed stop there. I know it was a little thing and she probably calls everyone “Darling” but it still made me feel all warm and fuzzy. The next was a fun guy with dark skin and maroon hair (I mention the dark skin only because it made the maroon hair that much more striking). He’s the one that advised me to buy a day pass that didn’t allow me to ride until 9:30, which was a little over half an hour away. The advice saved me nearly $15. After that, there was no conversation. Except with the people taking my money at the various gift shops and at lunch. I just walked around on my own. More on that experience and its effect on me tomorrow. Suffice it to say for now, it was a quiet day. Until the end. Tired and sore, I began to make my way back to the airport. Problem was that I hadn’t eaten dinner and didn’t want to pay airport or hotel prices. So I stopped at the Acton Town station and walked to where you run your tickets to leave. I decided to ask the man working there whether there was any place to eat near the station. He said no. He quietly named off the stops to himself, shaking his head at each one. One stop, he told me he wouldn’t send me to. “I wouldn’t want to send you to the Detroit of England,” he said apologetically. He finally said that if I’d be willing to go just one more stop on that out-of-my-way line, there’d be a whole host of restaurants to choose from. So I reluctantly dragged my aching body back onto the subway train. When the doors opened at the first stop, I seriously considered just getting out and trying the Tex-Mex place. But my resistance to eating Tex-Mex along with my physical desire to not get up out of my seat and my growing reluctance to sit in a busy restaurant by myself kept me planted. When I found out the flaky pastry was stuffed with seasoned meat, potatoes, and onions, I exclaimed that that was exactly what I was looking for. The price (under 5 pounds) was also right. She asked if I wanted her to put it in a bag. I started to say no, that I planned on sitting at one of their tables, when I realized she was offering to solve several of my problems. I was past ready to be back in my room and I didn’t want to sit and eat by myself. He looked doubtful but reluctantly said I was welcome. I then realized that I didn’t know which terminal the subway had taken me from that morning. That knowledge was important in that it was two different trains and only one of them was near the bus station that would take me on to the hotel. I think the man was starting to worry about me but we talked through it and I took an educated guess and chose wisely. Back at the airport, I caught the bus that would return me to my hotel. I saw us go by the hotel but since we were on the other side of the street, I assumed that I would need to wait until it looped back around. I saw a young woman looking anxiously at a map to the same hotel. I told her that it would come back around right about the time the driver stopped and announced something I didn’t catch. She asked if we needed to get off and I said I didn’t think so. The guy behind me gruffly insisted that we were to get off the bus now. I soon found myself standing on a dark street several blocks from my hotel, on the wrong side of a busy, four-lane road, with a very small college student from Tokyo. “Wanna walk together?” I asked. And so it was that I ended my solo sightseeing adventure in the company of another solo traveler. We made light small talk together and ran across the street when we saw a break in traffic. It felt good to walk alongside someone. All in all, those last two people went a long way to restoring my sanity after a full day of living inside my own head. What a blessing.